Materials used Neoprene Rubber,Nitrile Rubber etc. Rubber bellows are mainly used as dust proof in shafts which need dust free movement of sleeve over. The shaft and also due to free movement sensors can be actuated to control the flow in flow control valves. Rubber bellows are versatile seals used in a wide range of applications to seal dust and other environmental elements in application with a stroke or designed range of motion. Bellows are also used in applications that require anti-vibration and noise reduction. Bellows are used in machine to prevent dust particles metallic chips machine to avoid damages. It gives longer life to the machine part to avoid breakdown of machine. 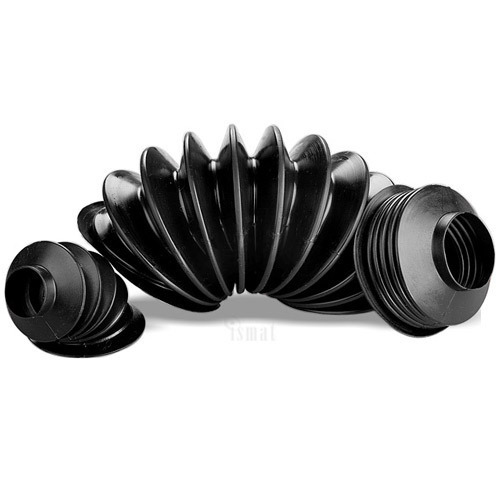 Rubber bellows give better look to the machine and cover the damaged or unseen parts of the machine.